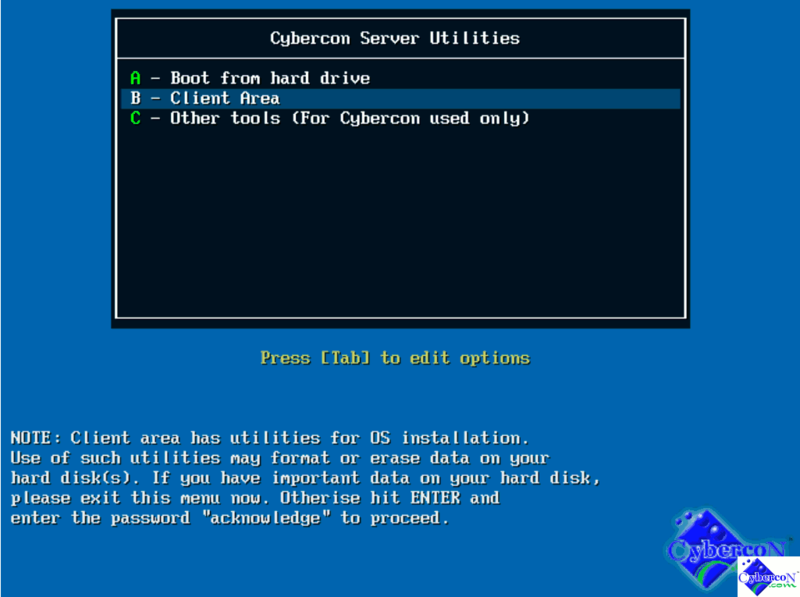 If the server you are using supports PXE boot, you can install or re-install your server operating system by booting to the Cybercon Server Utilities via PXE boot. 1. 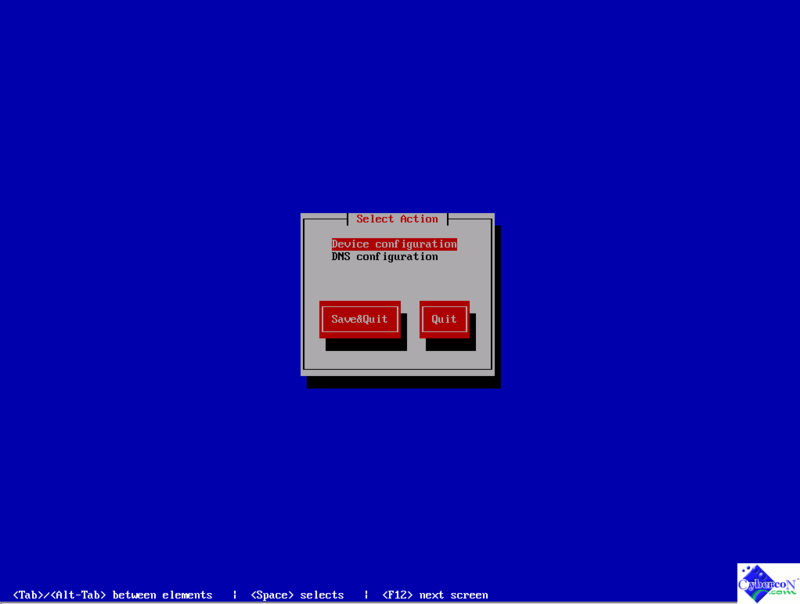 Once the server boot to the Cybercon Server Utilities via PXE boot, you can select Client Area from the menu. Please noted that entering the Client Area and using the utilities available in that area may cause data loss in the server (Such as clean OS reinstallation). Proceed only if you are 100% sure you do not need any data from the server or you have data backup in a different location outside the server. 2. In order to access the client area, you need to enter the word acknowledge as password to confirm that you understand the risk of losing data when performing OS installation. 3. 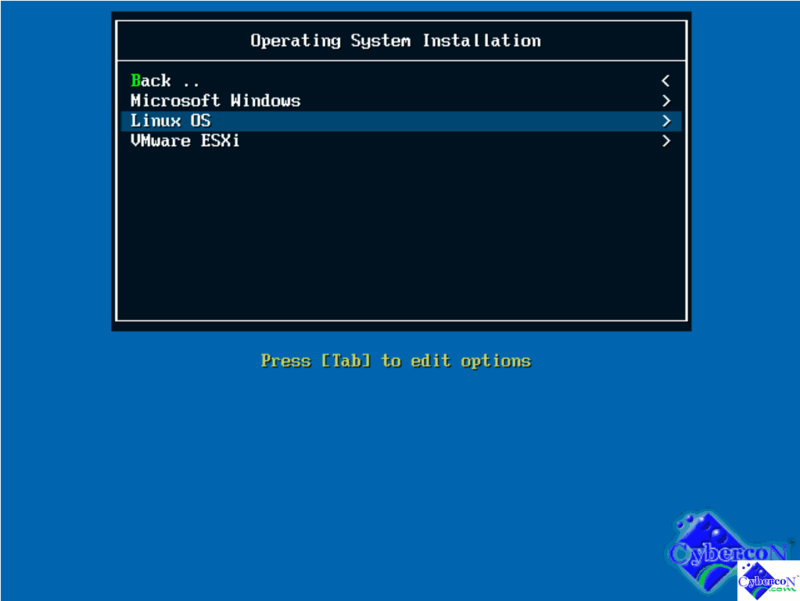 Select Operating System Installation from the Client Area Menu. 4. 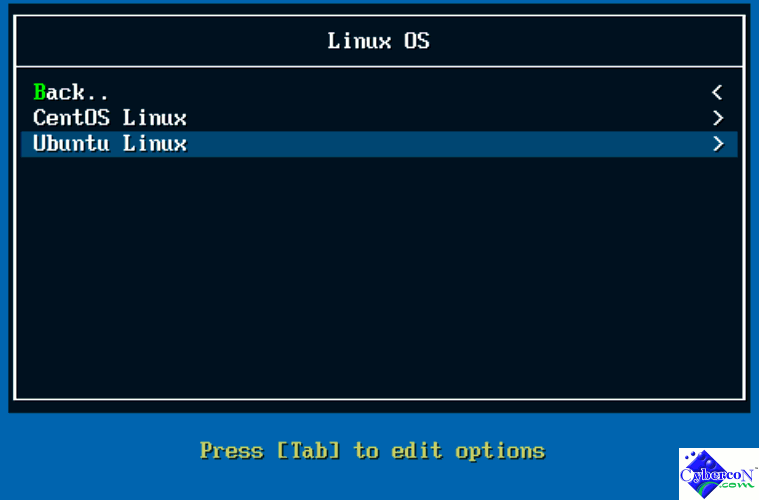 Select Linux OS from the Operating System Installation Menu. 5. 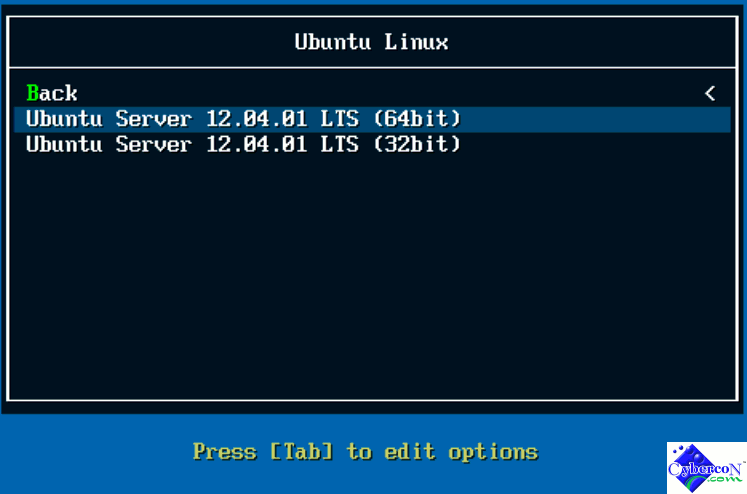 Select Ubuntu Linux from the Linux OS Menu. 7. The official Ubuntu install menu should start. Just choose Install. 8. 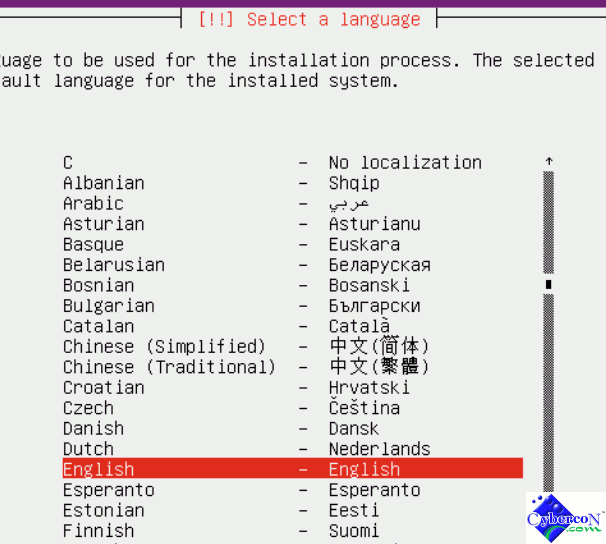 In the first Ubuntu installer screen, select your prefer language for the installation process. In our example here, we choose English. 9. Choose the location for your time zone. United States is the default location we set in our example here. 10. The next question the Ubuntu installer ask is if you allow the installer to detect the keyboard you are using for the installation. We choose No and select the keyboard ourselves. 11. 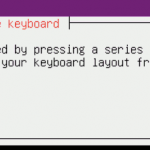 So now, the installer prompt you to select the keyboard. We choose English (US). 12. 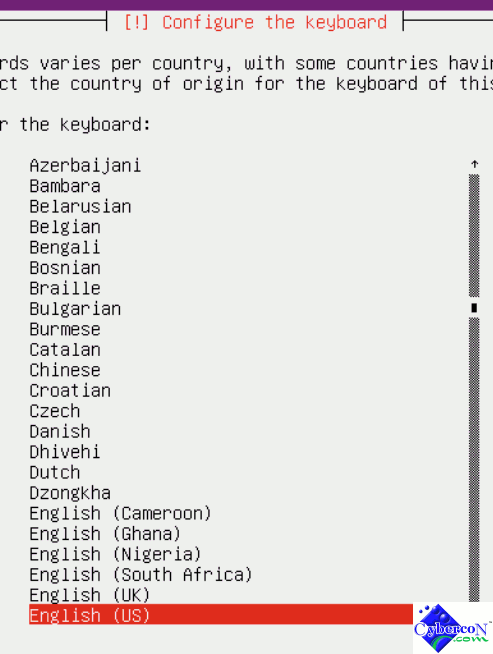 As for the Keyboard layout, select English (US) as well. 13. 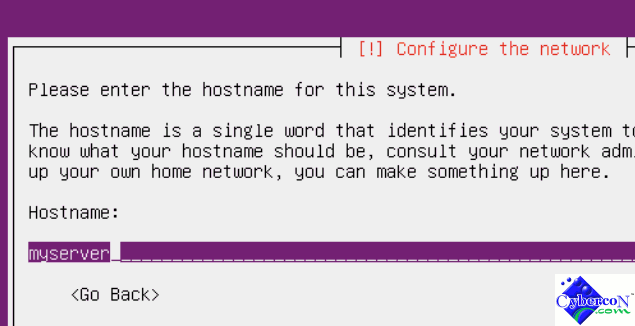 In the next scree, enter the Hostname for your server. This is going to be the server name. 14. By default, Ubuntu installer install the package files from one of the mirror sites. Therefore, select the region where the server is located. In our example here, we choose United States. 15. 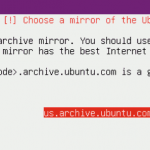 Based on the answer (location) we selected in the previous question, Ubuntu installer will suggest a archive mirror. Just hit enter to accept the default suggestion. 16. For the HTTP proxy information, just leave it blank since we are not using any Proxy Server for the HTTP access. 17. The Ubuntu Installer now loading some additional components. 18. Now, you need to enter the Full name you normal use for managing the server. This user is a non-root user. For security reason, Ubuntu prefer using a normal user for server management instead of root user. 19. Enter the username for the account you are creating. This is the log in name as well. 20. Enter the password for the account. You need to confirm the password when asked. 21. 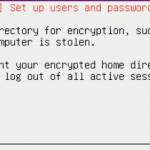 The next question from the Ubuntu Installer is if you need to Encrypt the new user home directory. It is up to you as far as security concern, in our setup example here, we choose the default answer which is No. 22. 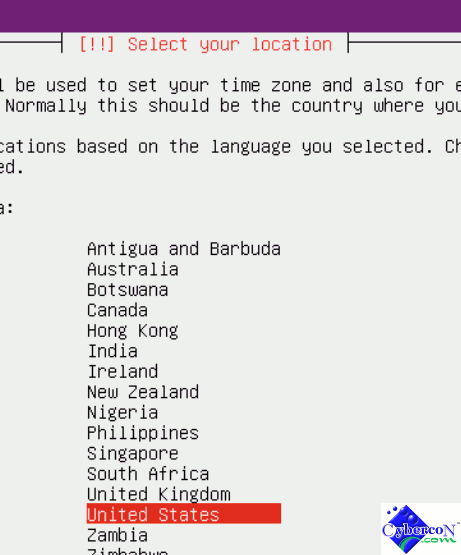 As for the server time zone setting in the next question, if the default location is fine, choose Yes. Otherwise, select No. 23. Since we need to choose the US Central time zone, therefore Chicago is selected. 24. 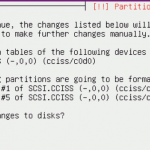 In the next question regarding Disk Partition, you can choose your own partition scheme. 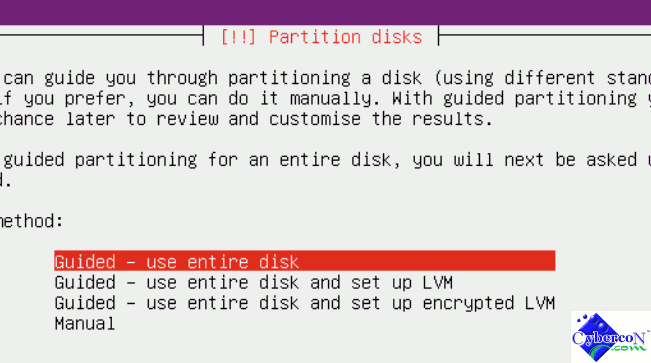 In our example, we choose Guide – use entire disk. 25. Select the disk you like to use. 26. 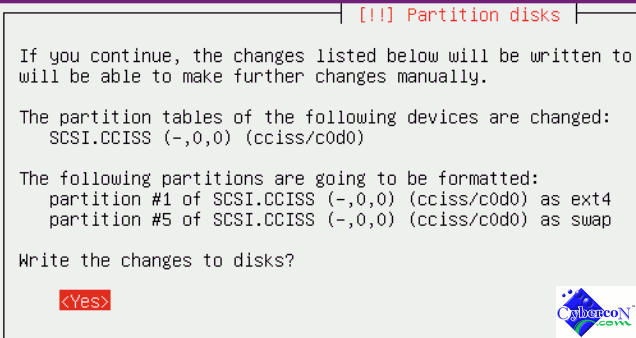 The Ubuntu installer will then ask you to confirm the partition scheme, choose Yes to write changes to the disk(s). 27. After that, the disk will be partitioned and formatted. 28. Once formatting is done, the install will install the base system and other related files. 29. As for the how the server handle system updates, we choose No automatic updates. We prefer update the server manually so that we can schedule the updates in maintenance window we prefer. 31. 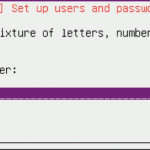 Since we choose LAMP as the server package, so we need to enter the password for the MySQL root user. 32. We are almost done here. 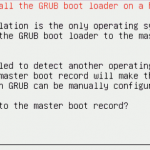 Now the Ubuntu installer ask you if you like to install GRUB boot loader in the master boot record, choose Yes. 33. 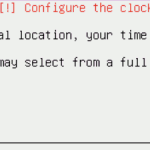 For the System clock set to UTC question, it is up to you if you prefer set to UTC or not. In our example, we choose yes. 34. Now the installation is complete. Hit Continue will end the installation and the server will reboot by itself. After the server finish booting up, you can log in with the user you created during the setup and perform the following tasks. – At the command prompt, enter “sudo apt-get update”. – At the command prompt, enter “sudo apt-get -u upgrade”. – At the command prompt, enter “sudo apt-get -y install ssh”. – Save the file and exit. – At the command prompt, enter “sudo /etc/init.d/networking restart” to restart the network. 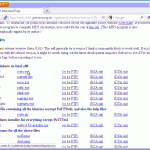 – Ping google.com to test if the network is working. After that, Ubuntu Server installation is done. 5. 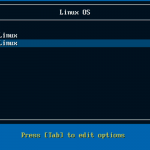 Select CentOS Linux from the Linux OS Menu. 6. Select CentOS Linux ver 6.3 from the CentOS Linux Menu. 8. 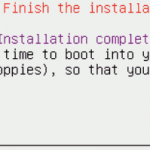 If the storage disk you are planning to install CentOS to is blank, CentOS installer may prompt you a Warning message. All you need to do is choose either Re-initialize or Re-initialize all. 9. 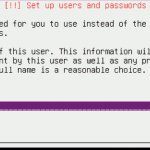 In the next screen, the CentOS installer will ask you to enter the root password for the server. Just enter your desire root password twice and choose OK to continue. 11. 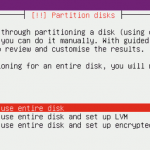 The CentOS installer will partition your drive and format the partition. It depends on the size of the drive/partition, it may take some times. 12. Once the Installer finish formatting the partition, it will start the Package Installation. 13. 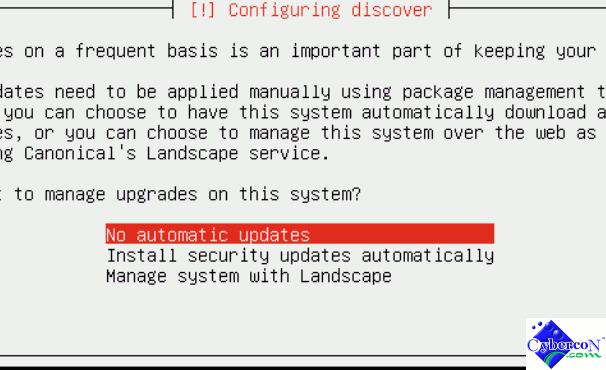 After the Package Installation, the Installer will run the post-installation scripts. And that includes updating the OS from the Internet directly. 14. After the post-installation scripts is done, the server will reboot by itself. 15. Once the server finish rebooting, it will launch the first time boot setup screen. You can customize the firewall and keyboard configuration here as well as the System services. The most important is the Network configuration. So choose Network configuration and hit Run Tool. 16. In the next screen, select Device configuration. 17. In the Select A Device screen, choose eth0. 18. Remove the check mark in Use DHCP and enter the Static IP, Netmask and Default gateway IP based on the IP information obtained from Cybercon. For Primary DNS server, you can enter 216.15.129.205 and 216.15.129.206. Hit OK when it is done. 20. 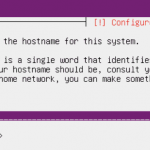 Enter the server and domain name in the Hostname area. The name you enter here will be the name of the server. Hit Ok when it is done. 21. Now, hit Save&Quit to save the changes. 22. 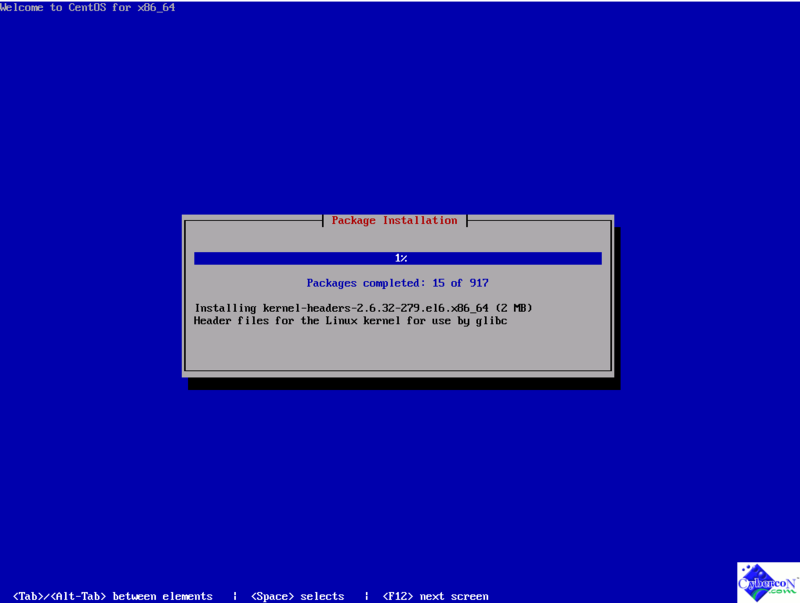 Now your CentOS 6.3 server is ready to go. If your client machine is a Windows based machine, you can use a free SSH client called PuTTY to connect to the Unix/Linux server. Here is how. 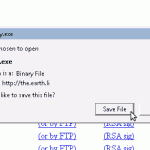 02 – Once you are at the PuTTY download page, scroll down to where you find the Intel x86 binary named putty.exe. 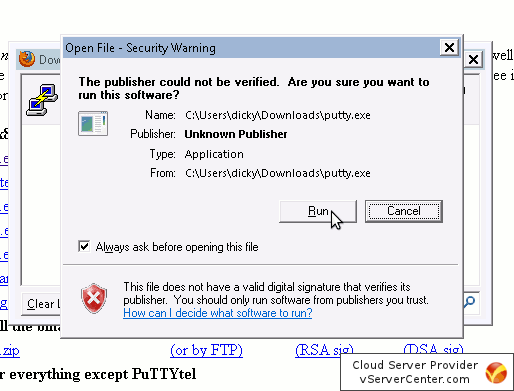 Click the putty.exe link to download the file. Be sure you are downloading the one under “For Windows on Intel x86” section. 03 – Your computer may ask you to save the file. Just save it in your computer for now. After saving the file in your computer, you can move the file to any location in your computer. 04 – Go ahead and run/open the file after you download the file. 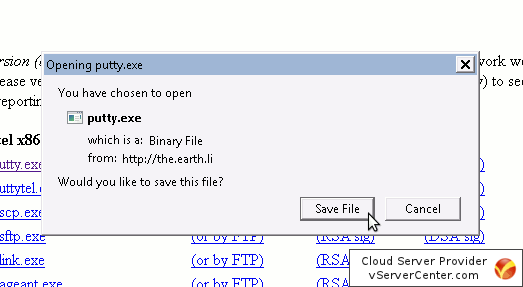 In my example here, I opened the Firefox Downloads window, right click the filename putty.exe and choose open. 05 – Your computer may ask your permission to run the file. It varies from different versions of Microsoft Windows as well as the security settings inside your Windows OS. 06 – If everything go well, you should see the PuTTY configuration. Please note that you do not need to install the software. The file you downloaded is an executable file. And that is all you need to run. 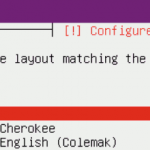 In the configuration window, enter the IP address or host name of the server you like to connect as well as the port number. The typical TCP port for for SSH is port 22. Once everything look fine, click the “Open” button to connect. You can save the profile to PuttY configuration so that you do not need to enter the same information again and again. 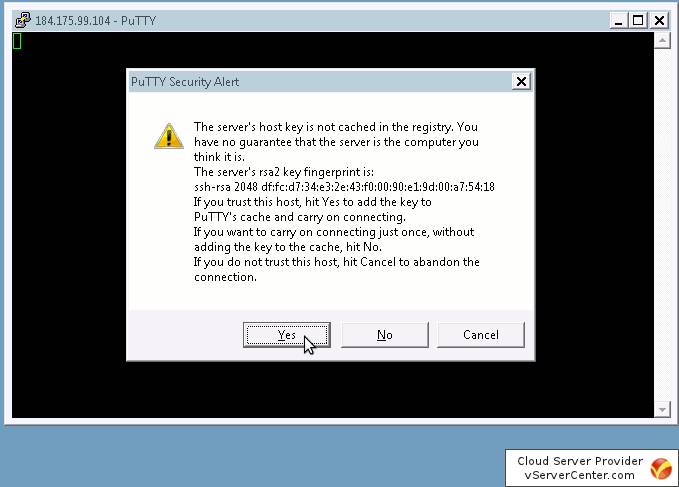 07 – If this is the first time you SSH to the server from the client machine, PuTTY will display a Security Alert warning window. All you need is click “Yes” to save the RSA key to your local PC. Once the key is saved, you will not be asked again. 08 – Now, you should connect to the server remotely via SSH. All you need to do is enter the user name as well as password to log into the server. Most of the Linux distribution ships with SSH clients. Graphical or Command Line. 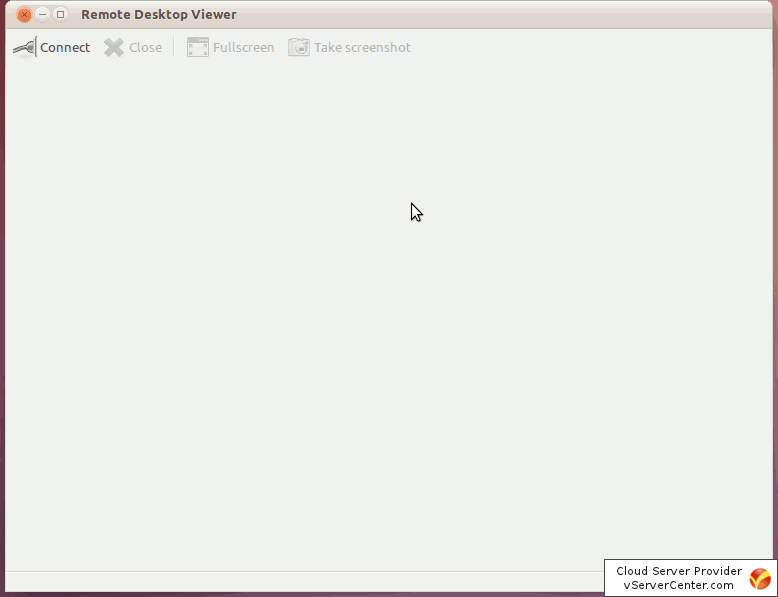 In the following example, I will show you how to connect to the remote Linux cloud server via Remote Desktop Viewer that shipped with Ubuntu Linux. 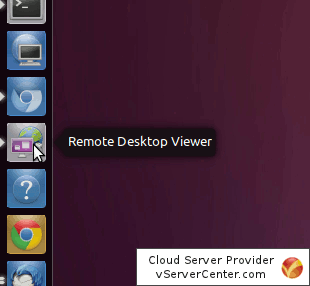 01 – In your Ubuntu Linux, click the Remote Desktop Viewer application to start it. 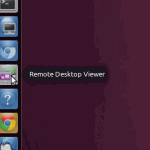 If you do not have it on your application bar, you can click the Ubuntu logo at the top left hand corner and search for “Remote Desktop Viewer”. 02 – Once the Remote Desktop Viewer launched, you can connect to a remote server by clicking “Connect” at the upper left hand corner of the Window. 03 – In the Protocol drop down box, select “SSH”. Then enter the IP address or host name of the server in the “Host:” text box. Enter the username in the text box provided and click the “Connect” button. 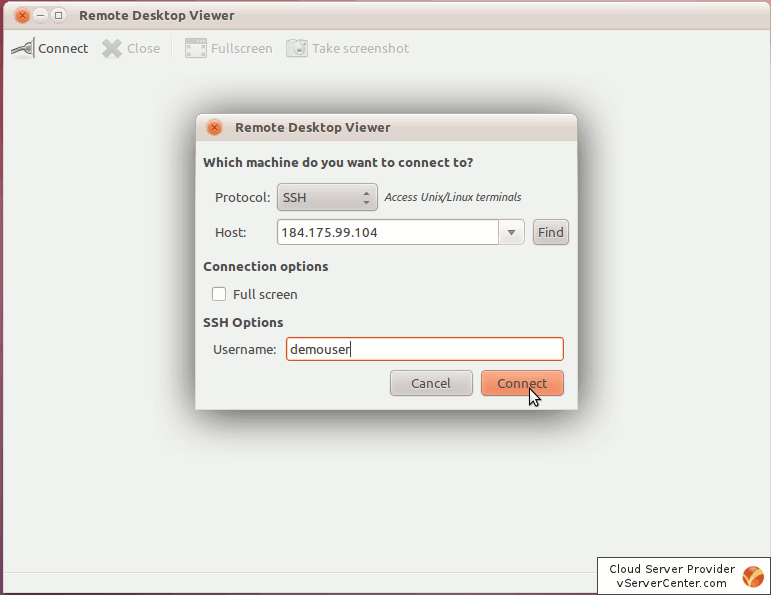 04 – The Remote Desktop Viewer client will try to connect to the server. Once it log in successfully, you should see a screen similar to the screen shot here. 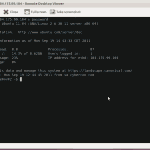 How to install Ubuntu 12.04 Server? 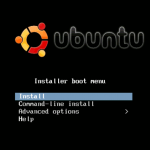 Installation of Ubuntu Server is pretty straight forward. If you have a Linux background, you should be able to install it without any trouble. 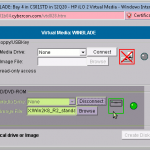 In the following paragraphs, I will show you how to install it on a HP blade server. The process of install it on a different server should be some what the same. 1. If you are install in via the HP iLO interface, choose the Java based Remote Console instead of ActiveX based Integrated Remote Console. I ran into problem with the Enter key with the integrated Remote Console. 2. Once you boot from the Ubuntu DVD/ISO image, you will see the Language screen. Just choose your favorite language to continue. 3. 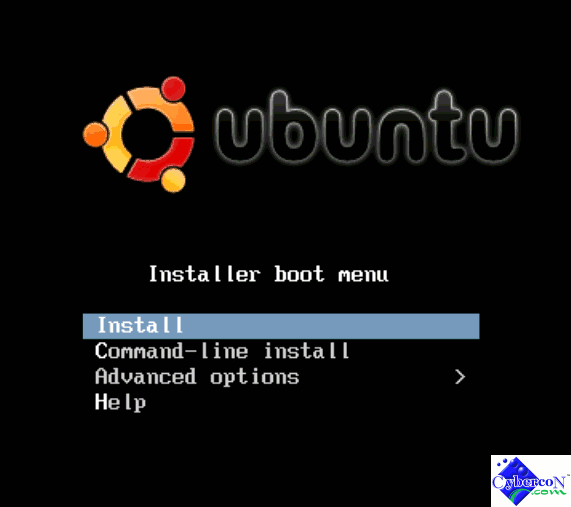 In the main menu, select Install Ubuntu Server to continue. 4. In the next screen, Ubuntu install script will ask you the language again. The language you choose here will also be the language for the install system. 5. Now, just choose the zone your server is going to be located or the zone you want the server to be set at. 6. The Install script will then ask you if you like it to detect the keyboard. I usually choose No since I know what keyboard I am going to use. 7. Now, choose the desired keyboard from the list. 8. Select the Type of keyboard you use. 9. In the next screen, the installation script will ask you to configure the network interface. Just choose eth0 and continue. 10. In our server environment, we need to set the network manually, so choose Configure network manually. 11. Enter the IP address assigned to you by Cybercon. Your IP address maybe different from the screen shot provided. 12. Enter the gateway IP assigned to you by Cybercon. Your gateway IP maybe different from the screen shot provided. 13. Now, enter the Netmask provided by Cybercon. 14. In the DNS server field, enter the one assigned to you. 15. 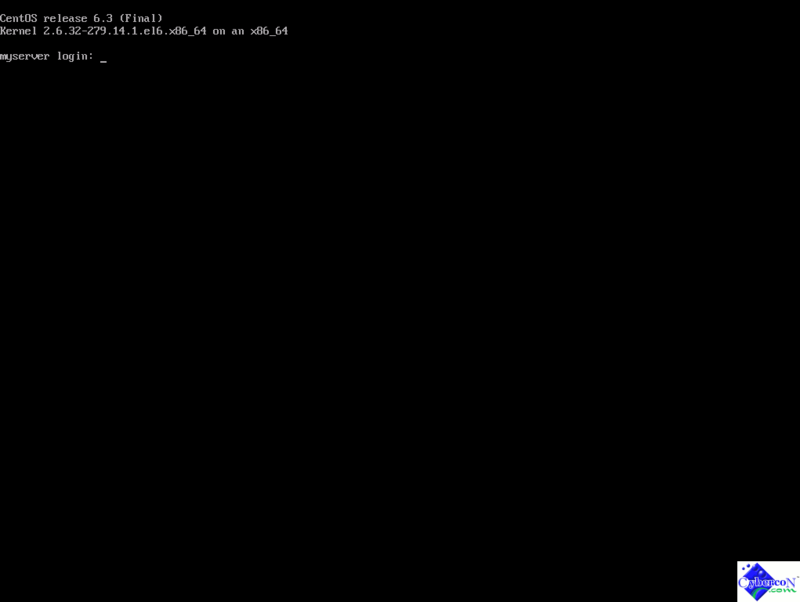 Enter the hostname of the server. 16. 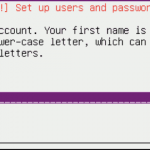 In Ubuntu, you need to create at least one user and you log in to the server with that user instead of root. Just enter the user name you prefer. 17. The install script will also ask if you like to encrypt the home directory. It is up to you if you like to do that or not. By default, I will choose No. 18. Select your time zone and continue. 19. For hard disk partition, choose the one you familiar with. In general, I use the entire disk and use LVM. So I choose Guided – user entire disk and set up LVM. 20. Select the available disk and continue. 21. 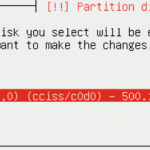 The installation script will ask you to confirm the partition scheme. Just confirm it to continue. 22. Enter the amount of space you like to use. If you want to use all the available space, just hit Enter. 23. Hit Yes to confirm the changes. 24. The installation script will install the files to your server now. 25. In the next screen, just leave the Proxy setting blank and continue. 26. For automatic updates, I normally want to do it manually so that I have more control. 27. Select the packages you like to install. If you want to SSH to the server, be sure to include OpenSSH Server. 28. If you select LAMP setup, the installation script will install MySQL for you. 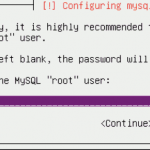 And in the next screen it will prompt you to enter the MySQL root user password. Just enter the password to continue. You need to confirm the password in the next screen. 29. 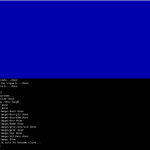 Now, the installation script need to write GRUB boot loader to the MBR. Just choose Yes to continue. 30. The Ubuntu Server installation is now completed. Hit Continue or Enter key to reboot the server. 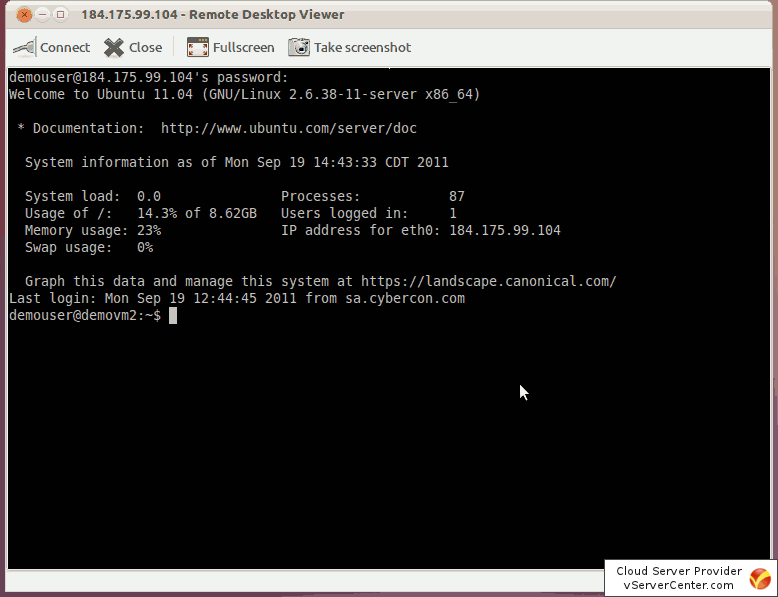 After the reboot, you should be able to log in to the Ubuntu server at the console. 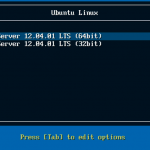 How to configure Network Settings in CentOS command mode? 1. 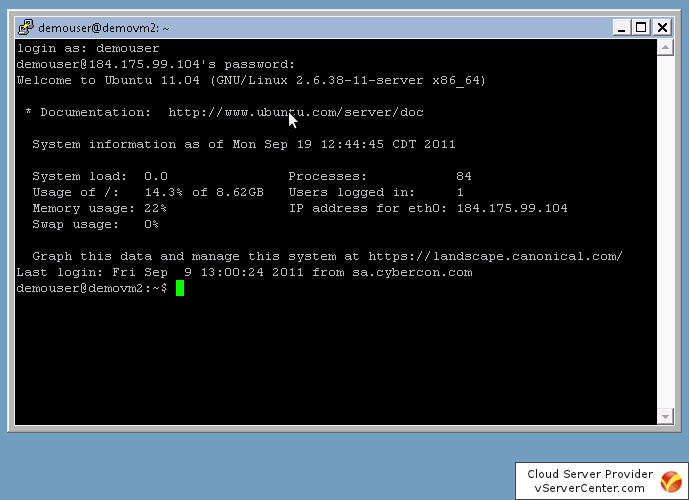 Log in to the CentOS via console. 3. Add the gateway information to the file network. You can use a text editor such as nano or vi to edit the file. Please note that your gateway and hostname should be different from the above example. Once you finish adding the GATEWAY line, save the file and exit. Again, your IPADDR and NETMASK settings may be different from the above example. Once you finish editing the file, save it and exit. Add the following 2 lines to the file. Please check the welcome email you received from Cybercon for the name server IP address. Yours may not be 216.15.129.205 or 216.15.129.206. Once that is done, save the file and exit. 6. After you modify all the above files, you need to restart the network. You can do so by issuing the following command. 1. 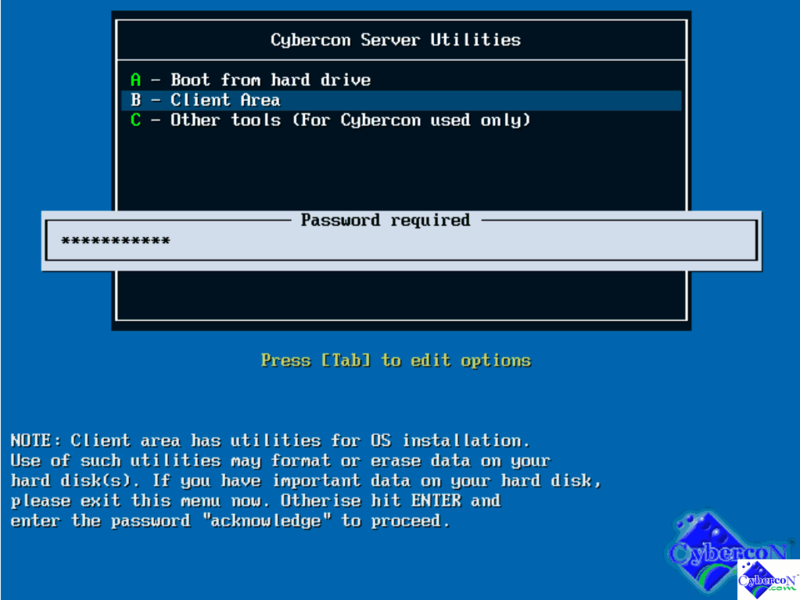 Open Internet Explorer and go to the URL provided by Cybercon. (You can find the URL from the welcome email you received from Cybercon after you order the service). Log in with your customer ID and password in the HP iLO web management interface. 2. In the iLO interface, click the Virtual Media tab. 3. Single click the Virtual Media Applet link. 4. Click the Browse button and locate the CentOS 6.2 ISO image in your local computer. 5. Once that is done, click the Connect button to connect the ISO as a CD/DVD drive. 6. 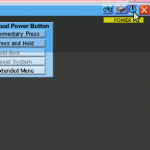 Do not close the Java window, just switch back to HP iLO interface and click the Remote Console tab following by clicking the Integrated Remote Console link. 7. From the top of the console screen, click the Power button and then choose Momentary Press to power on the physical server. 8. The server should boot from your ISO/CD/DVD image. 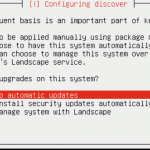 Select Install or upgrade an existing system to continue. 9. In the next screen, choose Skip to skip the media test. 10. 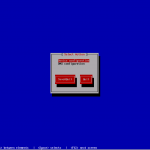 In the first install graphical screen, press Next to continue. 11. Choose the Installation process language and click Next. 12. Select the Keyboard type and click Next. 13. Select Basic Storage Devices and click Next. 14. In the next screen, choose Fresh Installation and click Next. 15. Enter the Server host name and click the Configure Network button. 16. In the Network Connections window, highlight the System eth0 and click the Edit button. 17. Check the box next to Connect automatically. Under IPv4 Settings tab, select Manual in Method drop down box. Enter the IP address, subnet mask, Gateway and DNS servers information provided by Cybercon from the Welcome Email you received. Click Apply to save the changes. 18. In the next screen, enter the root password and then click Next to continue. 19. For new install, just choose Use All Space and continue. 20. In the next screen, select the package set you like to install. In our example here, I just choose Minimal. 21. The server will start the installation. Once that is done, click the Reboot button to reboot the server. Client Requirement: Windows OS with Microsoft Internet Explorer (IE) version 8 or above and Java installed. 1. Open IE from your PC and go to iLO URL provided by Cybercon. <img src="http://tutorials viagra pharmacie.cybercon.com/wp-content/uploads/2012/05/02-After_Login-150×150.png” alt=”” title=”Virtual Media” width=”150″ height=”150″ class=”alignleft size-thumbnail wp-image-105″ />3. After you log in to the HP iLO interface, you will see the Server Status Summary. Single click the “Virtual Media” tab. 4. 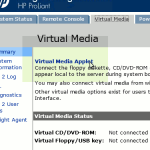 Right below the heading “Virtual Media”, click the “Virtual Media Applet” link. 5. A new Java applet window will pop up. Click the “Browse” button in “Virtual CD/DVD-ROM” section. Locate your Operating System ISO image in your local drive and open it. 6. Click the “Connect” button to mount the ISO image as CD/DVD drive. Once that is done, you should see a green light next to the drive icon. 7. Now, single click the “Remote Console” tab next to “Virtual Media”. 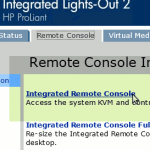 Then click the “Integrated Remote Console” link to launch the Remote Console. 8. The Remote Console will popup as a new window. At the upper right hand side, click the “Power On” icon and follow by clicking “Momentary Press” under “Virtual Power Button”. That should power on your dedicated server. 9. 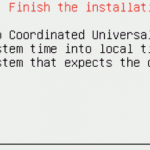 Follow the onscreen OS installation wizard to finish the installation. Note: If you are installing Windows server 2003/2008/2008R2, you need to install drivers provided by HP after the OS installation is completed, you can find the driver from the following link. Create new Virtual Machine with Hyper-V Manager. © 1995 - 2012 cybercon.com All Rights Reserved. Telephone: 1.314.621.9991 (24x7), Web: www.cybercon.com.